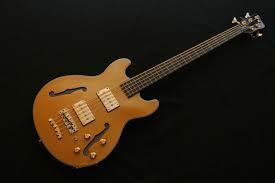 This week I’ve been working on Chick Corea’s wonderful composition Spain with my fretless Warwick Thumb SC. In this video I’m demonstrating a little harmonic trick I discovered for playing over the first two chords, G major and F#7. It creates a beautiful Spanish phrygian sound over the F#7 chord. Read on and I’ll explain what that means and how to play it. Spain is not only one of Chick Corea’s most popular compositions, it’s one of the most popular pieces in all of modern jazz. It was originally recorded in 1972. The following year Spain appeared on the album Light As a Feather by Chick Corea’s band Return To Forever. It’s popularity has endured and Chick Corea still loves to play Spain at most of his concerts. That’s an unusual situation for a jazz musician with such a varied repertoire and such a wide variety of projects and collaborations. I make a point of going to Chick Corea’s gigs whenever he’s in London on tour and I’ve now seen him play live more times than I can keep track of. There are very few occasions that he hasn’t played Spain in some guise or another. So why is this composition so popular, why has it’s appeal endured and grown over nearly half a century? For me, the essence of this piece and the secret to it’s enduring appeal is the beautiful Spanish phrygian harmony. It’s an unusual sound to hear in modern jazz and in some ways it’s quite hard to define. But it’s that Spanish phrygian harmonic influence that I’ve tried to get to the bottom of in this practice diary. Phrygian is the name given to one of the modes of the major scale. Modes are scales with the same combination of harmonic intervals. If I play a phrygian scale starting on F#, it’s the same notes as a D major scale. As I mentioned in the video, you can think of the key for Spain as being D major. And if you play all the notes from a D major scale over the G and F# chords then it will give you a lydian sound over the G and a phrygian sound over the F#. So, phrygian is the obvious scale to play over an F# root note in the key of D major. But that’s not actually what I’m doing. As I explained in the video, the scale I’m playing is in fact not specifically a phrygian scale. But it does, to my ears, have a phrygian sound. How Can You Create a Spanish Sound on the F#7 Chord? The D major scale contains the notes D, E, F#, G, A, B and C#. In the video I use this notes on the G major chord creating a Lydian sound. 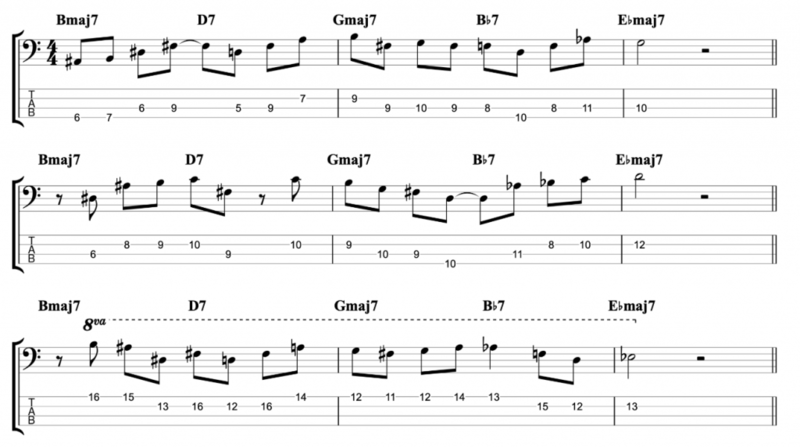 An issue arises if you try to continue using those exact same notes over the F#7 chord. An F# phrygian scale implies an F#m7 chord because it contains an A natural which is the minor 3rd of an F# chord. The F#7 chord contains an A# which is the major 3rd. You could play an F# phrygian scale over an F#7 chord on the A natural would function as a #9. However, if you try and play this way you will be leaving out one of the most important defining notes of the F#7 chord, the major 3rd. It will be a weaker sound. If you play the notes of the D major scale, but change one note, A natural becomes A sharp. D, E, F#, G, A#, B and C#. Then you will retain the phrygian sound but also have a much stronger harmony over the F#7 chord. I would call this scale a phrygian dominant scale and it’s actually a mode of the harmonic minor scale. What Makes it a Phrygian Dominant Scale? The character of the phrygian sound comes from the semi-tone interval between the root and the second. In this case, the notes F# and G. It’s dominant because it’s played over a dominant 7th chord and contains all the notes of an F# dominant 7th chord, unlike the standard phrygian scale which is minor in it’s tonality because it contains all the notes of a minor 7th chord. If anything, this scale has an even more Spanish sound than the standard phrygian because it contains all the notes of two major triads a semi-tone apart. If you analyse the notes of the scale, it contains F#, A# and C# (F# major triad) and G, B and D (G major triad). Play these two triads one after the other or any other two triads a semi-tone apart and the sound takes you straight to Spain (the country, not just the composition). It’s the presence of these two triads that give the phrygian dominant scale it’s Spanish sound. The only other note in the scale is the E natural, which is the dominant 7th of F#, making it a Phrygian dominant scale. This week I’m doing something that I don’t don very often, I’m practising slap bass. And I’m learning from the very best by playing excerpts from a book called The Best of Victor Wooten. In this video I’m demonstrating a passage from a piece called A Show of Hands. 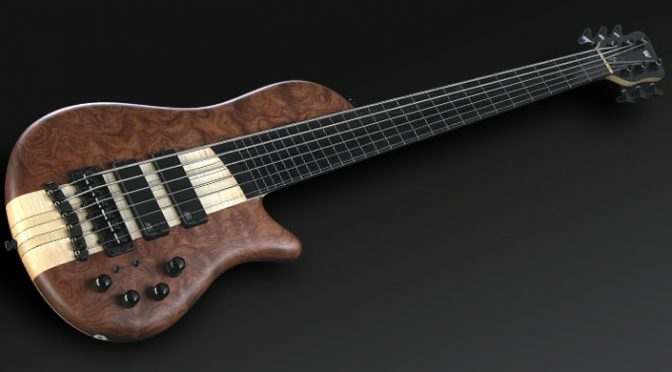 Why Use a 6-string Bass? 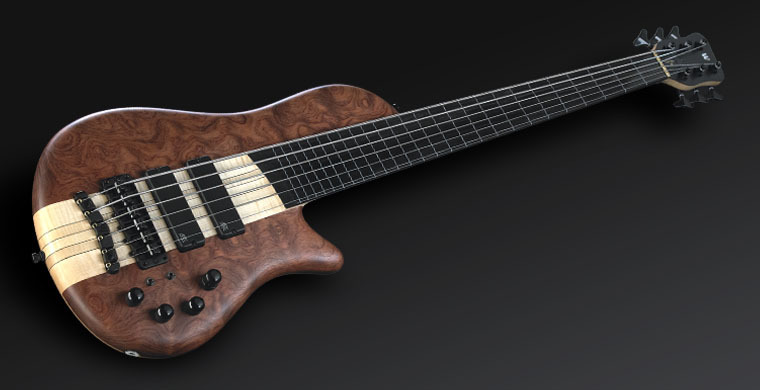 Victor Wooten always plays 4-string basses! There are two reasons why I’m using my Warwick “Steve Bailey” 6-string bass for this. The first is that it’s the bass I use on most of my gigs. I usually play finger style but I’m often asked to play slap bass on one or two tunes in a set. So, I need to know that my slap bass chops are ready to go when required. And I need to know I can do it on my first choice gigging instrument. 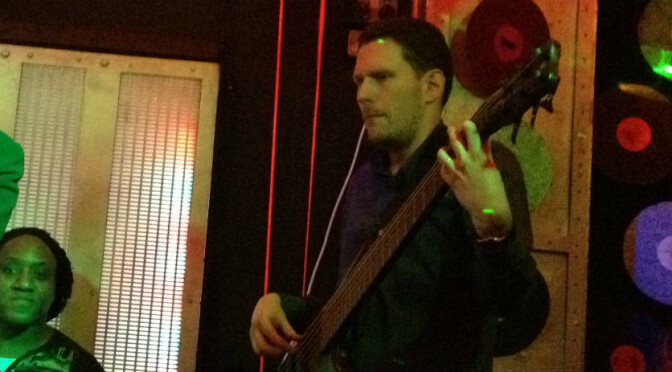 I can’t stop during a gig to switch onto a 4 or 5 string bass. Also, I often need to play slap bass on just one part of a song and finger style on other parts. 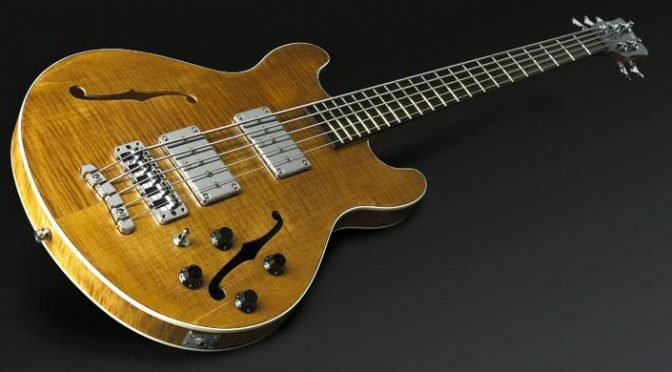 The second reason is that many of the transcriptions in The Best Of Victor Wooten, including A Show of Hands are written and were originally performed by Victor Wooten on a 4-string bass tuned A-D-G-C. He calls this his tenor bass. This tuning is the same as the first four strings of a 6-string bass. It’s not possible to achieve this tuning on a standard 4 or 5 string bass without changing the strings or using a capo. 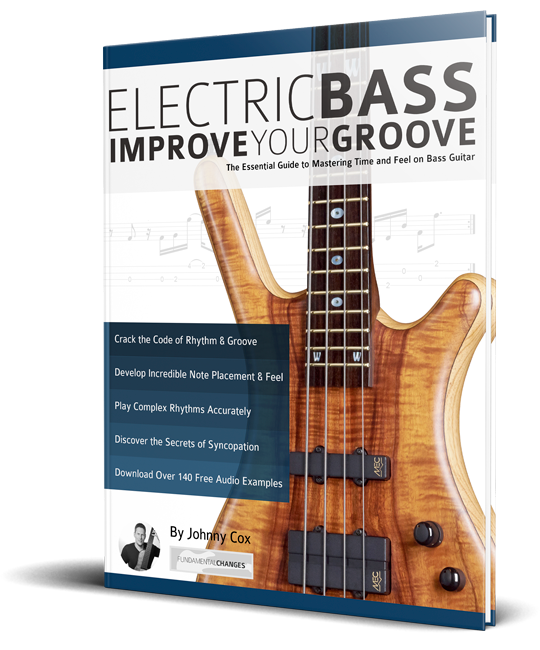 My 6-string bass can play all of the transcriptions in the book at the correct pitch. Including all the pieces played on Standard E-A-D-G tuning and the A-D-G-C tenor tuning. 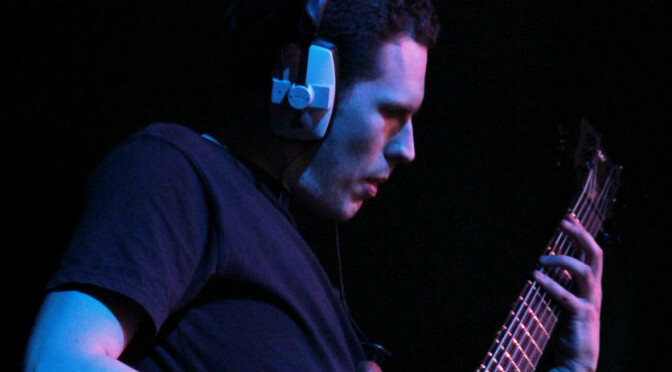 Is it harder to play slap bass on a 6-string bass? Yes, but the more I practice, the less I notice the difference. There was a time when I used to do all of my slap bass practice on 4-string bass. I didn’t like slapping on the 6-string because the first string, C, felt too small to slap. And it got in the way when trying to pull the second string, G.
I started practising slap bass techniques on my 6-string bass for the reason I outlined above. I was playing 6-string bass on virtually all my gigs and when I was called upon to slap, it felt awkward. My slap bass chops on my 6-string were not where they needed to be. So I realised I needed to practice slap bass on my 6-string bass. Now I feel comfortable playing slap techniques on my 6-string including on the high C-string. As a result I get all the benefits of extended range that you get from playing a 6-string. 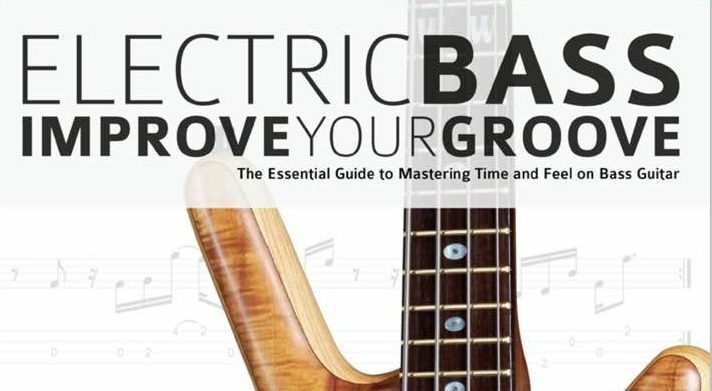 I highly recommend learning to slap on a 6-string bass, it might take a bit longer to master but for me the benefits of the extended range and the versatility far out weigh the challenges. This week I’ve been working on chord voicings based on a chord that I heard Oteil Burbridge play. Check out this video and the chords are written out at the bottom of the page. Oteil Burbridge is a wonderful bass player. A fellow 6-string player with an incredible grasp of melody and harmony. If you’re not familiar with his playing I would highly recommend checking him out. When I heard him play the chord I demonstrated in the video I thought it had a really interesting and modern sound. When I’ve found a really cool voicing like this one, I like to try and find every possible permutation of it. A great place to start is with major keys. Every chord is a sequence of intervals. See my video on intervals here. There are four notes in this particular chord voicing which creates three intervals. Starting at the lowest note you go up a fifth to the next note. Then a second to the third note and then another fifth to the fourth and final note. So I started by working out every permutation of these three intervals within a major key. Each key gives you seven chords. I’ve demonstrated these in the video in the key of F major. So I’m using only the notes F, G, A, Bb, C, D, E.
If you want to take this a step further you could apply the same process to other scales, such as harmonic minor, melodic minor or diminished. You could also work out every possible mathematical permutation of a fifth, a second and a fifth. A fifth could be a perfect fifth or a flat fifth and a second could be a major second or a minor second. Arguably you could include a sharp fifth and a sharp second as well which would dramatically increase the number of possible permutations. However, I would prefer to think of a sharp second as a minor third and a sharp fifth as a flat thirteenth. 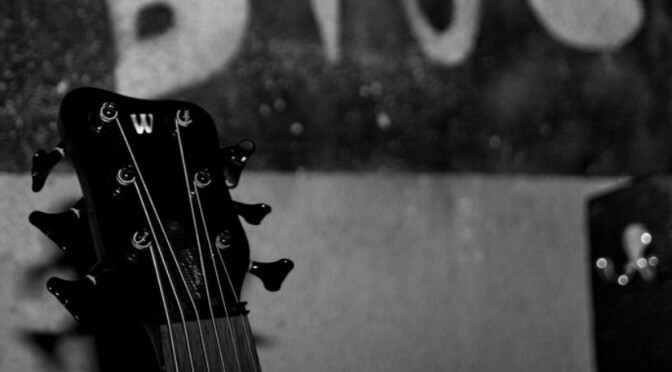 They may not all sound great and some of them might be quite tough to play. However, it would be a great exercise in working out harmony. Here are the seven chords I worked out in the key of F major using the Oteil Burbridge chord voicing. This week I’ve been working on a bass chart written by the wonderful British bass player Laurence Cottle. The first time I heard Quite Firm was when I was a teenager. I can still vividly remember it because it completely blew me away. Years later, Laurence Cottle was kind enough to give me his bass chart for it. It’s a piece I dig out every now and then when I want to work on my finger style chops and my time keeping. It’s a roast trying to keep up with Laurence’s recording which features his incredible band including some of the cream of British jazz musicians. When I play this piece I use a three finger technique with my right hand. It features my thumb, which also provides string damping, and my first and third fingers. If you’re interested in learning more about this right hand technique then please click on this link to find my video lesson on right hand techniques. If you’d like to hear more from Laurence Cottle then check out his website LaurenceCottle.com. In this practice diary I’m demonstrating lydian sounds over major chords using my fretless Warwick Thumb SC. My inspiration for this is Jaco Pastorius’ composition Havona from the album Heavy Weather by Weather Report. Don’t be put off by words like lydian and mode. They’re much simpler than you might think. You can think of modes as types of scales. Lydian is the name of one of the modes of the major scale. In fact it’s only one note different from a major scale. The fourth note of the scale is a semi-tone higher than the major scale. Click here to check out my video lesson on intervals if you’re not sure what a semi-tone is. Jaco uses a lot of lydian harmony in Havona. I’ve taken four chords from Havona, E major, C major, B major and G major and played two bars on each chord. Most jazz musicians prefer to use the lydian scale rather than the major scale when playing over major chords. The reason is that the natural 4th found in the major scale clashes with the third in the major chord. But the raised 4th doesn’t clash. In fact it creates a really nice sound. For the first four bars I’m playing a seven note phrase using 16th notes. I’ve taken the phrase from Jaco’s solo in Havona, he plays it over an E major chord. The notes in E lydian are E, F#, G#, A#, B, C# and D#. Each time I repeat the seven note phrase, I move it one note up the scale. Using this method I explore all of the possible harmonisations of this phrase within the mode. After two bars on E major I switch to the notes of C lydian without stopping or altering the seven note phrase. The reason I’m using an odd number of notes is so the phrase will start on a different subdivision each time I change the harmony. So I’m exploring every possible harmonic variation and every possible 16th note rhythmic variation of the phrase. Another aspect of Jaco’s solo on Havona is the use of triplet as well as 16th note phrases. 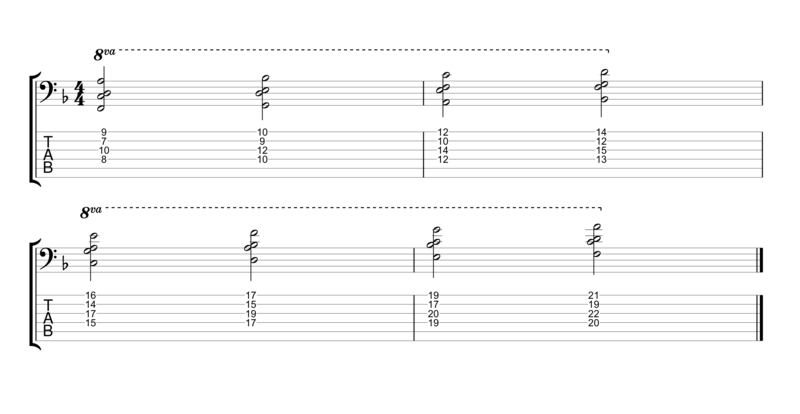 For this reason I’ve used a triplet phrase taken from Jaco’s solo for the next four bars. Starting on B lydian, Ive played the phrase and this time moved it down one step each time I’ve repeated it. After two bars on B the harmony switches to G lydian and the phrase continues. 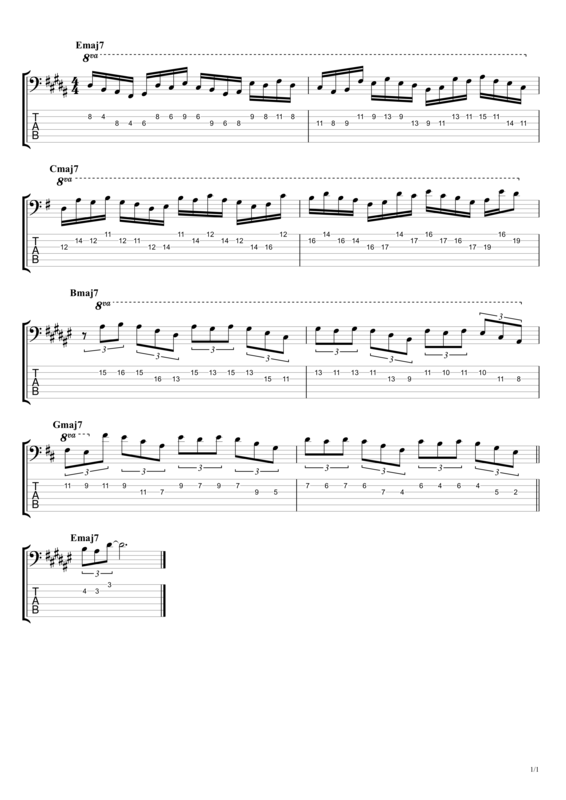 I’ve written the TAB for 6-string bass in standard tuning. 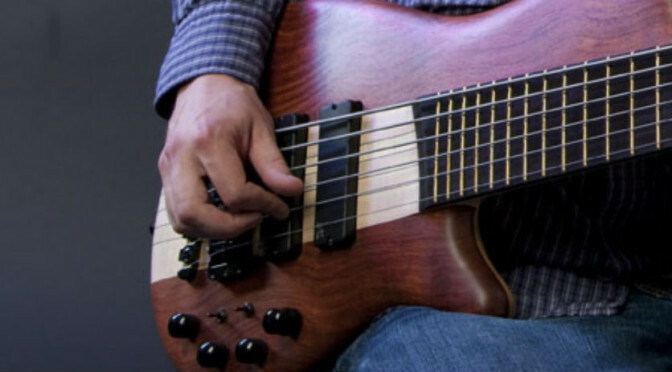 You can adapt these ideas for 4 or 5-string bass. You could start by playing the phrase one octave lower. ie. playing it exactly as it’s written without the 8va marking. In this video, I’m jamming with myself at home using my fretless Warwick Thumb Single Cut 6-string bass guitar. I’m improvising on the spot and the bass is being played through my Warwick Hellborg Amplifier rig, including the Hellborg preamp. Here’s a video I made with my Warwick Thumb SC Fretless, it’s such a beautiful sounding bass and I just love to play it. I always wanted to experiment with synth sounds on my bass. When the Roland GR-55 came out and the GK-3B divided pickup for 6-string bass. I knew I had to try it out. This video is actually an effort from very early on in my Roland GR-55 use. However, when I listen to it now I really like it, and it’s proved popular on Youtube with nearly 20,000 views. That’s a lot for an instrumental bass video. All the sounds in the video apart from drums are made using the bass played through the Roland GR-55. I programmed the drums in Protools. You can make drum sounds with the bass and the Roland GR-55, but that doesn’t interest me so I didn’t. For a long time I’ve wanted to try out playing my bass through a Roland guitar synth. And having looked at the Roland GR-55 I was convinced that the technology was good enough. 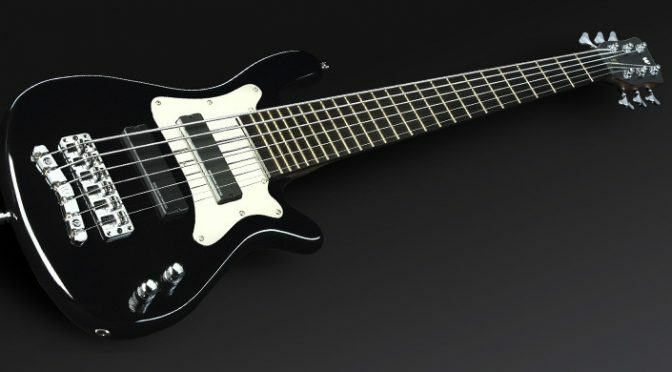 So, I installed a Roland GK-3B divided MIDI pickup onto my new Warwick “Steve Bailey” Artist Series bass a few weeks ago and bought the GR-55. Here’s a video of what I’ve come up with so far, hopefully there will be plenty more from me using this in the near future. So far I’m extremely impressed with the potential of the GR-55 and I love the Warwick as well. I hope you like my compositions and I hope you have as much fun watching this as I had making it!